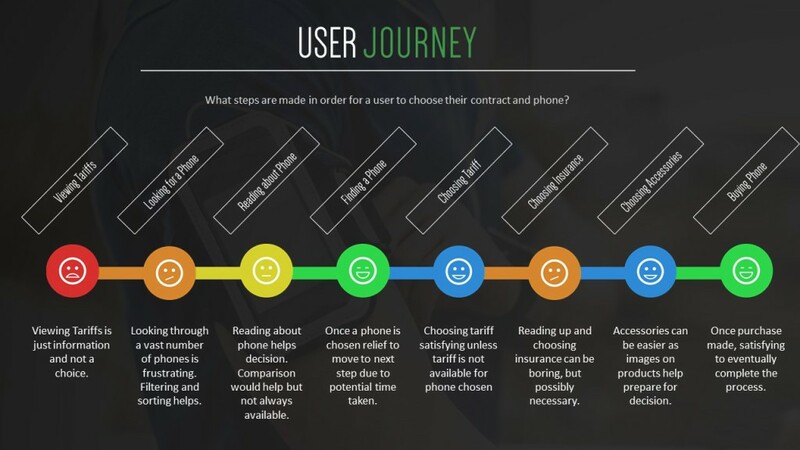 This user journey displays the thought process and pain points when purchasing a phone online. Here are more in depth descriptions of each section of the user journey. Viewing Tariffs – At present, most websites provide the option to view tariffs however when selecting one, all this does is take you straight to the phone options and you are effectively not choosing a tariff. This creates an unneccesery step. Look for a phone – There are a number of different phones to choose from and this can be somewhat frustrating. Having sort and filtering facilities may help ease this but the inability to activately interact with the phone may proove to be detrimental to decision making. Reading about Phone – This will provide a lot more information on the phone which should help make a decision on whether this is the correct phone or not. Having a phone comparison option certainly helps towards this. Once again though, without being able to interact with the phone a decision may proove to be a hard one. Finding a phone – Once a decision has been reached on which phone to purchase this will be a rewarding step, providing information on potential costs are made aware at an early stage. Choosing a tariff – This could be somewhat frustrating if the option you require increases the cost of the phone and/or monthly cost to above your budget meaning that you have to return to the choosing a phone option. On selecting the tariff there is a satisfaction that most if not all your requirements are met when you plan to go to the website checkout. Choosing Insurance – While this is not a necessery step, to read through all the information to decide whether or not this is required can be time consuming and not very rewarding. Buying Phone – Once the process is complete, there is exciting that a new phone will be coming soon and anticipation in opening it and trying it out. The only frustration is the wait. If clear details are provided on when the item will arrive, there should be no frustration should the delivery take a long period of time.